Prouty Woods is a unique and significant tract of woodland within minutes of Route 495. The property includes 1600 feet of frontage on Long Lake and the top of Wilderness Hill with expansive views to the west and north including Mount Monadnock. The combination of forest, hay fields and riparian zones provide much-needed habitat for a variety of species. The forest has been under professional forest management for many years. Walking trails maintained by Stewards of the Littleton Conservation Trust (LCT) connect to a one-mile trail called the Two Brothers trail that extends to Conant Park. The main house serves as the headquarters for the New England Forestry Foundation (NEFF). The Wilderness House (King Center) situated on top of Wilderness Hill hosts educational programs that promote an understanding of forestry and the natural world. 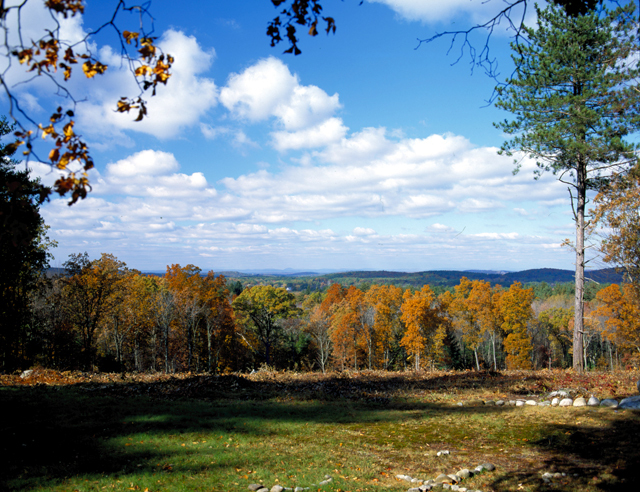 Prouty Woods is a 107-acre parcel of land located centrally in Littleton. The land is a unique mixture of mature woodland, mowed fields and lush wetlands, which are just a short, walk from the center of town. The outstanding feature of Prouty Woods is Wilderness Hill, which rises 170 feet above the surrounding land. There are beautiful views of the Monadnock Range to the north and Mount Wachusett to the west. The hill and the adjoining hill to the Southwest are locally known as the Two Brothers. The Two Brothers Trail, which bisects the property, has access from King St. across from the Congregational Church. The trail passes through mowed fields of the town -owned Morgan Property and on to Prouty Woods land. It passes through the upper terminus of a densely vegetated wooded wetland, crosses over the hill through mature woods with sparse undergrowth, and then traverses down to the Long Lake shore. 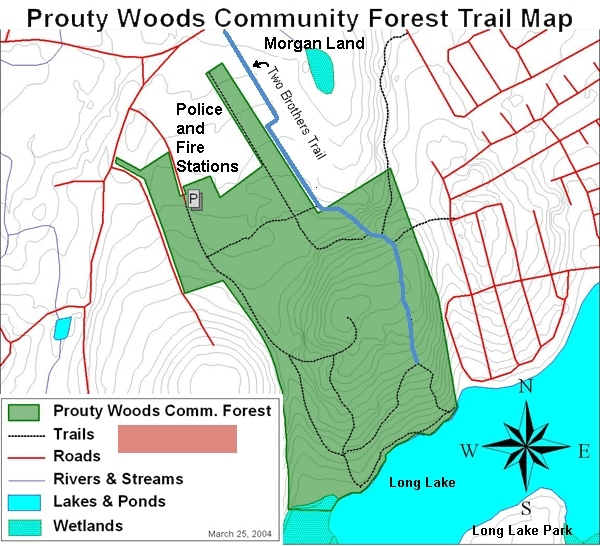 Additional trails connect Prouty Woods to Birch Street and Edsel Road. Many old interesting stone walls in usual patterns cross through the property. Watershed Protection: The Prouty Woods south facing hillside is a major component of the Long Lake watershed, with direct access to the waterfront. The undeveloped hillside provides a clean groundwater and surface water supply to the lake. The mature tree canopy and undisturbed leaf litter provide erosion protection and protection from pollution. This protected property is critical to the continued health of the lake. The north-facing hillside is the watershed to the large wooded wetland and intermittent stream system at the toe of the slope of Prouty Woods hill. Numbers of seasonal streams break out of the hillside creating the hydrology needed to sustain the lower wetlands. The streams typically have a red maple tree canopy with a dense shrub layer of high bush blueberry, burning bush in sections, and withered winterberry. Skunk cabbage, sensitive ferns, sedges and rushes are also abundant within the wetlands, Water from the wetland flow north in small brooks to Beaver Brook and then eventually to the Merrimack River. Vegetation and Wildlife Value: The top of Wilderness Hill is a broad rounded knob. The north-facing slope near the top is maintained as an open brushy field and provides vegetative diversity and fringe that is attractive and beneficial to wildlife. Moles, voles, turkey, bluebirds, meadowlark and hawks frequent these types of areas. Areas that are mowed once per year also provide the sapling growth that is an invaluable food source for browsing animals during the long winter months. Wildflowers and grasses are a good food supply and cover for grazers, rodents, snakes, birds, insects and butterflies. The remainder of Wilderness Hill is mature woods with oaks, shagbark hickory, red maples, sugar maples, black birch and stands of white pines. Other areas on the north-facing hillside are more densely vegetated with a thick shrub layer or dense stands of pines. Deer tracks and burrows for woodchucks and skunks are visible. Fishers have been spotted on the property. Geology: Wilderness Hill is in the center of a row of hills, named the Long Pond Brothers on the USGS topographic maps. The hills are adjacent and are aligned in an east -west direction. Wilderness Hill is the highest of the nearby hills. The tops of the hills delineate the boundary between two watersheds. Water that flows from the hill tops southerly into Long Lake is in the Sudbury-Assabet-Concord Rivers drainage basin. Drainage from the northerly side of the hill flows into the Stony Brook subbasin via Beaver Brook within the Merrimack River Watershed. The local hills are considered to be “drumlins” which are generally north -south oriented on an individual basis. Drumlins are composed of glacial debris deposits resulting from the north to south grinding action beneath an advancing continental glacier commonly thought to be about one mile thick. This glacier is thought to have melted away completely about 12,000 to 15,000 years ago. The drumlin normally forms when a pinnacle or small hill of bedrock is encountered and the glacial ice was plastered over it. It is not known whether the bedrock is close to the surface or whether it could be over 100 feet deep. No bedrock outcrops have been observed on the land. Drumlins are composed of a dense unstratified mixture of clay, silt, sand, gravel and boulders. Ice rafted boulders called erratics, are present on the land and are identified by their size, often exceeding four to six feet in diameter. The erratics were deposited upon recession of the glacial ice mass. The surface layer of soil, just below the recent humus layer, is composed of windblown silt to a depth of six inches to one foot, that was deposited in the cold desert environment following the retreat of the ice mass. Long Lake was formed by a massive ice block that broke away from the melting glacier and was partially buried in outwash deposits (stratified sand and gravel). When the ice block melted, the resulting depression became filled with water and resulted in the lake we see today. The opposite side of the lake has a long glacial meltwater channel that drained the melting ice and continues to be the outlet for the lake. That channel is part of the 185-acre town-owned Long Lake Park. In 2007, NEFF conducted a timber harvest using sustainable forest techniques involving 1-acre “patch cuts”, which have the additional benefit of increasing wildlife and vegetation diversity. On Wilderness Road (which is off Foster Street) between Faye Park and the Fire stations. A short distance from Foster Street are a parking lot, kiosk, and barn. To access NEFF offices take the first right on Wilderness Road, park behind the garages and walk down the driveway to the main entrance under the portico. Trail maps are located at the kiosk. The New England Forestry Foundation (NEFF) purchased this 107-acre property from the Prouty family in the fall of 2003 to establish an exemplary forest demonstration site. The Town of Littleton holds a conservation easement on 85 of the 107 acres. Prouty Woods is a truly unique and significant tract of woodland within minutes of Route 495.